Your Kids, Teenagers and Adults will play with this every day of there vacation. Hours of FUN. A bag full of sand toys. Shovels and pails, balls, sifters, shapes and forms of all sizes. Some have trucks, goggles, frisbees, ect. 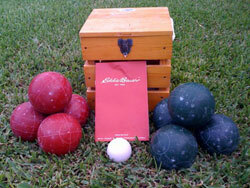 Try some lawn bowling while relaxing in the sun! Bean Bag Toss Lawn Game. Great to play on grass or sand. Fun for all ages. What better time to work on your game.